Description: The Mystic Mage, AKA Jay Lanchester, offers awards "to recognize those websites which have worked hard enough that their efforts be rewarded." Sites are evaluated on creativity, content, design, navigation, and originality. Citation: "I am happy to present you with the Award of Excellence for an outstanding website. We have found your site interesting in design as well as content. Thank you for your positive contribution to the Internet community." Description: The Handyman's Awards recognizes other webmasters for the work and effort and the creativity and imagination they put into their web sites. Sites are evaluated on content, coding, design, and navigation. Citation: "I enjoyed learning about your high school. Great content. Thanks for sharing. 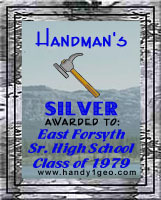 ... Congratulations, Your site has been awarded the "Handy Silver Award" for an excellent site." Description: Morning Star's Awards Program "give[s] awards to other web masters and web mistresses" "to encourage those who create web sites to do it cleanly and with taste" and "to have fun with [their] creativity and web site building." Sites are evaluated on content, coding, navigation, and graphics. Citation: "We'd like to thank you for a site well put together. We have completed the process of viewing and evaluating your site. We're pleased to say that your site has been accepted for our Golden Cup award. ... Have a wonderful day, and be healthy. May the Great Spirit bless you always." Description: Dr. James Charles (Doc Jim) Bouffard "fight[s] against schemes and scams and for humanitarian causes" with Doc Jim's Help Page! 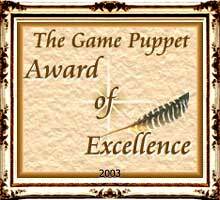 and offers this award to recognize sites which add "an enlightened presence to the Web." Sites are evaluated on "feel good" content, navigation, spelling and grammar, load time, and links, and must be family friendly and child-safe. 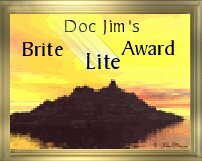 Citation: "Following a careful review, East Forsyth Senior High School Class of 1979 has won "Doc Jim's Brite Lite Award." Display it with pride. You've earned it! ... Again, congratulations!" Description: Dennis's Web Tree recognizes other web sites with this award. Sites are evaluated on design, layout, navigation, content, graphics, and load time. Citation: "Your site was great to visit. Keep up the good work. 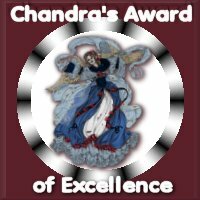 You have earned the GOLD Award"
Description: Chandra's Awards offers a wide range of general and theme awards. Sites are evaluated on design, load time, originality, and user-friendliness. Citation: "I have visited your web site today and I must say I had a great time exploring it. You have done a wonderful job! Therefore, it gives me great pleasure in presenting you with my award. ... Congratulations and keep up the good work!" Description: Rudolf Esterer, a German webmaster from southern Bavaria, recognizes "other Webmasters for their effort" with his award. Sites are evaluated on design, navigation, content, load time, links, and personal impression. 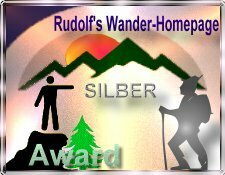 Citation: "I have visited Your site http://www.EastForsyth1979.org three times and I decided, that You have earned my Rudolfs Wander-Award in Silver. ... You earned 80 points for Your page. This is my award in silver. ... Have many pleasure with my award." Citation: "I just came from checking your site and I am sending you my award." Description: Professional Business Systems, a web development and marketing company based in Vancouver, British Columbia, Canada, offers awards "to celebrate those involved in the creation of the Internet." The Content Award "is presented to web sites with one key goal in mind: getting information out to the world." Sites are evaluated on content, graphics, spelling, grammar, and links. Citation: "We have reviewed your site and currently it does not qualify for the Elite Award. One of the criteria for the Elite Award is that the site must meet all other criteria, Content, Design, Technical as well as being viewable in all resolutions and browsers. As you are aware your site does not look the same in Explorer as it does in Netscape ( viewed with Netscape at 800x600 and true (32-bit) color) and as a result it does not meet the criteria for the Elite award. HOWEVER!!! it does qualify for the Content Award. It's a great site for alumni and I wish you success. ... Again congratulations, well done!" Description: Gigi's Dream Catcher Awards Program recognizes "family friendly sites that show creativity." Sites are evaluated on content, design, graphics, and navigation. 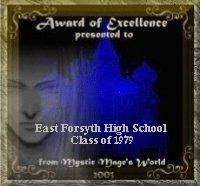 Citation: "I have reviewed your site East Forsyth High School Class of 1979 in accordance with the criteria for this program. Your site has won the Gigi's Dream Catcher Silver Award. I enjoyed my visit and Congratulation on a job well done." Description: JustFolks, an e-zine from Dawggone Communications, presents this award to "those web sites with a positive, inspirational and upbeat message" which help "make the Internet a more Upbeat place!" Sites are evaluated on content, design, navigation, appearance, load time, and family-friendliness. Citation: "Congratulations! Your web site was chosen as a winner of the Upbeat Web Site Award offered by JustFolks: The e-zine for positive people."